What does it take to be a successful freelancer? 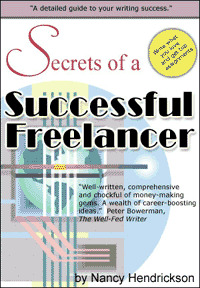 My skeptic side was working overtime with this title from Nancy Hendrickson--Secrets of A Successful Freelancer. Yet as I was reading this book, I knew I had found a valuable resource when I reached for my yellow highlighter to capture some of the information. When you read this book, you will want to keep that highlighter handy because Nancy's book is filled with insight, wisdom and valuable career guidance. In the opening pages, Nancy writes, "More and more specialized magazines are hitting the newsstand each year. And, as baby boomers reach the peak of their buying power, you'll see even more niche publications being released...What does this mean for you, the writer? Work. And lots of it." Step-by-step Nancy continues and shows you how to evaluate your different niches and tap this resource to sell your freelance writing. This book contains a good mixture of Hendrickson's personal stories combined with writing tips and interviews with experts (other professional writers and editors). I found it particularly interesting the interviews with editors about their likes and dislikes. It wasn't surprising to hear that most submissions fail in the simple area of researching the magazine. The typical writer is in too much of a rush to get their query or magazine article to the editor--but the successful writer takes the time to study the market, understand the needs of that editor, then target the publication. The advice is simple yet so needed in today's marketplace. I'm not going to give away Nancy's nine final secrets of her success as a freelance writer. From my own freelance writing career, I know that if you take those nine secrets and diligently follow them, you will reach your writing dreams. If you would like more detail about the exact contents of this worthwhile resource, then use this link to view the Table of Contents for Secrets of A Successful Freelancer. Whether you are beginning to write freelance articles or have been in the marketplace for many years, everyone can profit from the valuable information in this book. You can purchase it immediately by clicking on the book cover image below.